Migration is never far from the top of the news agenda, but what practical steps are we taking to recognise, and address, the issue of people migrating for environmental and climate change-related reasons – now and in the future? 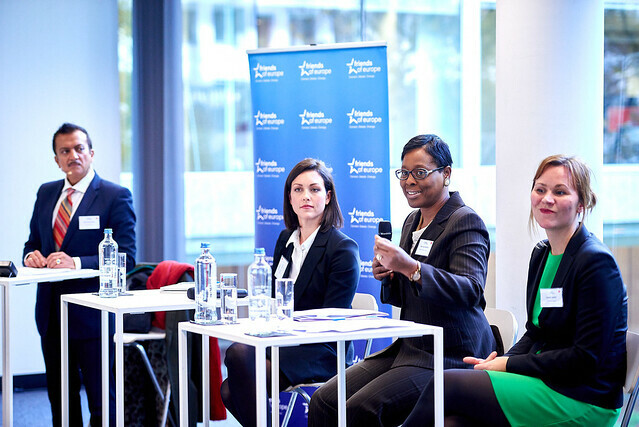 That was the burning question at a Friends of Europe policy insight event in Brussels on 8 November, which debated the complexities of defining, preparing and empowering those whose lives and livelihoods are impacted by environmental factors. These include events ranging from: sudden disasters like earthquakes; extreme weather events such as typhoons; increasingly occurring floods and droughts, and slower-onset challenges like rising sea levels. With an estimated 200m environmental migrants expected by 2050, ‘Future Flows: forecasting and responding to environmental migration’ asked how they could be sufficiently protected and what plans were in place, or are needed. The issue of defining such migrants – for example as ‘climate refugees’, with the legal status that comes with it – is still up for debate, explained Caroline Zickgraf, Deputy Head of the University of Liège’s Hugo Observatory. The term ‘climate refugee’ doesn’t recognise that most people are internally displaced, “doesn’t encapsulate all the dynamics that link climate change and migration” and could lead to “misguided, isolated policies”, she said. As an example of an alternative approach she said some South Pacific island states had a policy of ‘migration with dignity’ and were pre-emptively training residents for integrating elsewhere in future. Debate moderator Dharmendra Kanani, Director of Insights at Friends of Europe, said “the pace of change of climate change is re-writing what we need to think about” and suggested that the European Commission carry out work to provide an “evidential base” for a new typology. Sheila Sealy Monteith, Ambassador of the Permanent Mission of Jamaica to the EU and UNESCO, said care should be taken not to conflate ‘environmental migration’ and ‘climate migration”, as it wasn’t straightforward for people to attribute their circumstances to climate change. There was an crucial need for decision-makers to “more seriously understand” what was happening on the ground, she added. Meanwhile Linnéa Engström, MEP and Rapporteur on women, gender equality and climate justice, said a global strategy for addressing climate displacement was needed, but it should be “gender responsive”. Citing the fisheries sector, in which women’s work is essential but “never recognised”, she said women were strong change-makers and that “these are the people that we need to empower in order to tackle these challenges on a local level”.